SAN FRANCISCO — Alien Apparatus Company, Inc. announces the release of The Alien Hand Microphone Stand, a microphone stand designed specifically for miking speaker cabinets. The Alien Hand was designed to overcome the inadequacies of the traditionally used floor-mounted microphone stand. Its design consists of a plastic spring clip with an extended arm to hold a microphone. 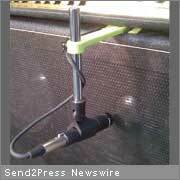 The spring clip is simply inserted into the gap between an amplifier and speaker cabinet. The flexing of the clip between the amplifier and the cabinet provides friction to hold The Alien Hand in place, but yet it can be easily positioned by lifting up one side of the amplifier. Because of the unique spring clip design, no permanent attachments or modifications need to be done to the music gear. Guitarists, recording engineers, and sound men commonly capture the sound coming out of a speaker with a microphone to either record it or to capture the speaker’s coloration for further mixing and amplification. Using The Alien Hand Microphone Stand eliminates floor clutter associated with the unwieldy floor-stands that are traditionally used. Further, because there is no direct contact with the floor, “floor hum,” a sound transmitted from the floor to the microphone that often intensifies to a sharp squeal, is eliminated. The elegant, streamlined look of a speaker cabinet equipped with The Alien Hand Microphone Stand also provides plenty of adjustability to hit the “sweet spot” for capturing the speaker’s sound. A vertical pole is provided that is adjustable up and down and the microphone clip pivots. The entire device can be moved sideways and in and out merely by moving its location in the gap. With all of these adjustments, centered, off-centered, and off-axis recording of a speaker cabinet may easily be achieved. The Alien Hand also works well with many combo amplifiers. The sides of the spring clip have been designed with notches which allow the device to be compressed and slipped under the carrying handle of the amplifier. The notches serve to capture the handle to keep the positioning secure. The Alien Hand Microphone Stand retails for $24.99 and can be purchased though Alien Apparatus Company’s online web store and through their reseller network. Music stores interested in carrying The Alien Hand Microphone Stand are invited to contact Alien Apparatus to become a reseller. Alien Apparatus Company, Inc. was founded in 2003 and is located in San Leandro, CA . Its Solo Performer Show Controller system is widely used by musicians to provide backing audio, lights, lyric displays, and effects changes to their shows. For more information, please visit the Alien Apparatus Company website at http://www.alienapparatus.com .